Using a food processor, thermomix or blender chop the nuts up (not too much) then gradually add the fruits to the mix. I haven’t put any set quantities of ingredients because it’s up to you and your taste buds! You will see the mixture getting wetter add the powder! If your machine needs a bit of help (a lot of them struggle with the thick consistency of the mixture) add a little bit of water at a time until you get a rollable mixutre! It shouldn’t be too sticky though. You can either add the seeds and coconut now with the motor running or just combine in a mixing bowl with a spoon. 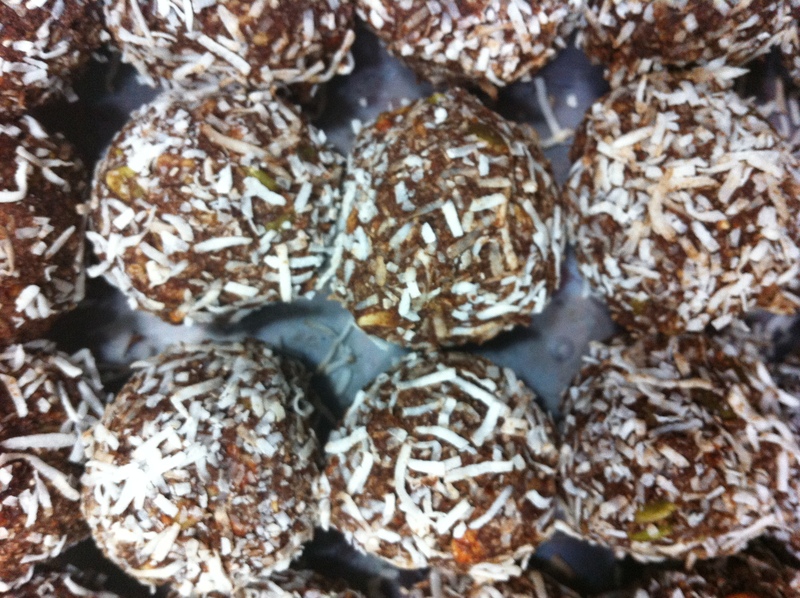 Spoon mixture into desired sizes and roll in shredded coconut. Place in an air tight container and put in the freezer for 8hrs to set! Hey presto!! Previous Post A Fruitful Start to the Day!